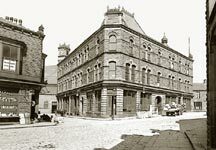 The Co-operative Store took up the whole corner of Crown Street, Carlton Street and Albert Street. Photo: Although it doesn't look it here, the Co-op Central Store, around 1920, was a hive of bustling activity! There was a gents' outfitters next to the entrance leading to the first floor and the halls, where all the main functions and dances took place. The larger was, for some years, a cinema where silent films were shown and the smaller was used for whist drives. No dance was ever complete without a whist drive first! The shop on the corner (now Oasis) was first the offices where the divi was paid out and later a tobacconists. Down Carlton Street were the boot and shoe shop, the clogger's, a glass and china shop and the main grocery department. The corner shop (now Pot Stop) sold paint and wallpaper, later carpets and furniture. Also on the first floor was the Carpet Room, where the Women's Co-operative Guild held their meetings, millinery and the funeral department. 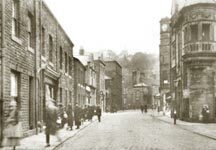 Photo BT896: Not a single vehicle rattles down the stone setts of Crown Street, pictured in the early years of the last century. The Liberal Club, opened in 1899, is on the right with the Co-op Central Premises just behind, while private houses mix with shops and businesses on the left. Lloyd also takes us round Crown Street and New Road - revealing where Ted Hughes' father had a business. The New Californian Dance Band was just one of the bands which played at the Co-operative Dance Hall in the 1930s. Here the band calls itself, rather poshly, a Dance Orchestra.